Making accurate predictions is difficult. 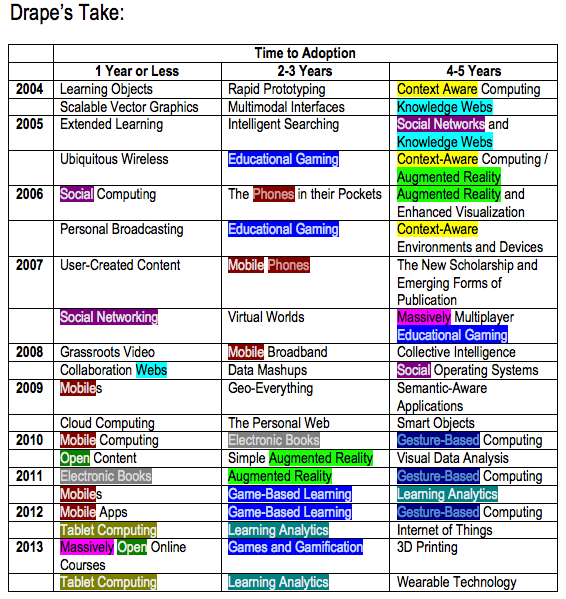 After the New Media Consortium released their 2013 Horizon Report for Higher Education, I reviewed the predictions they had made annually since their first report in 2004. Having nothing but the highest respect for members of the NMC community and appreciating the process followed to make their projections, I was curious to see how things have turned out through the years. I then took out the crayons, attempting to identify any patterns in their prognostication. Clearly, the routine of one phenomenon traveling from right to left - to eventual adoption over the course of time - was most ideal. Mobile (education) won't be going away anytime soon. Greater society's adoption will make sure of that. 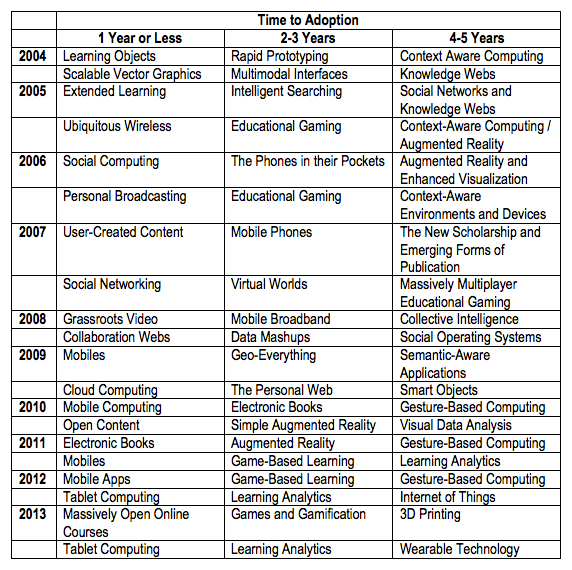 Educational gaming will NOT hit widespread adoption in 2007 (2005 + 2), 2008 (2006 + 2), 2011 (2007 + 4), 2013 (2011 + 2), 2014 (2012 + 2), 2015 (2013 + 2), nor - based on NMC predictive patterns - at anytime before the year 2020. Gaming is DUE, however, to spend several years in the "1 Year or Less" category. We may actually see solid in-class teacher use of learning analytics by 2016. Wearable technology should spend at least ten years on NMC lists, as Google Glass and its counterparts work their way around the body.